If you have served as part of our military, thank you for your service. We owe so much to you and yet you get so little credit. We are here to help and will be very transparent in the pros and cons of VA loans. 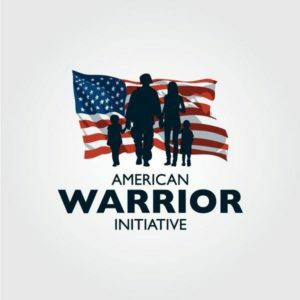 We are proud supporters of the American Warrior Initiative (AWI) and will be hosting an AWI event this September. 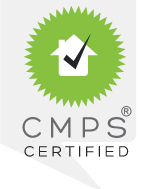 Please click on the link below to learn more! VA loans are a great loan program that provides up to 100% financing for qualified veterans and their families. Often times, The rates for VA loans are lower than Conventional loans and with no down payment required*, if you have served, VA loans are a great benefit. Our experienced VA Loan team will take the time to help you learn about the VA program and how you can take advantage of this benefit. 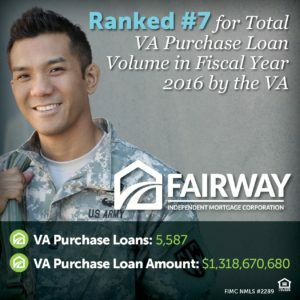 Fairway Independent Mortgage Corporation is a national leader in providing VA loans. You will be in good hands! To be eligible for a VA Loan, veterans, active duty service members, National Guard members, and reservists must meet the basic service requirements as set forth by the VA. It is also important to note that spouses of military members who died while on active duty, or as a result of a service-connected disability, may also qualify.